Are you a fan of Hai Street Kitchen's sushi burritos and rice and salad bowls? Well, now they've opened Wok Street (1518 Chestnut Street) another way to enjoy Southeast Asian fast food. Wok Street opened Mid-May, but I didn't notice it, because it's next to a building on Chestnut Street being renovated, so you might pass by it too, but if you're in mid-town looking for a quick, healthy, filling nosh, then I suggest you pay attention, it's on the left side if you're heading west. HERE'S WHAT WOK STREET SAYS... At Wok Street, clean cooking techniques highlight fresh and flavorful vegetables and marinated proteins. 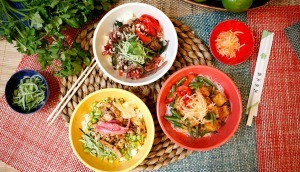 Chose from Wok Street’s signature bowls, or customize your own to satisfy the cravings that fit your mood. Start with your choice of rice or noodles then add your favorite mouth-watering protein and seasonal veggies. Top off your creation with one of Wok Street’s zesty homemade sauces and crunchy toppings. 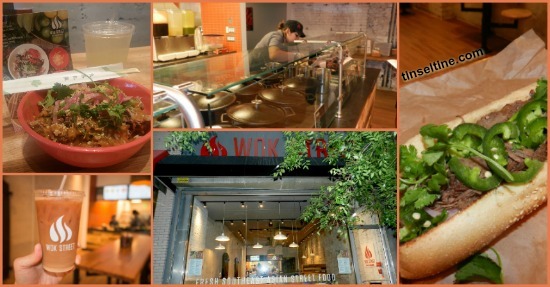 Wok Street’s bowls are packed with all natural ingredients and authentic flavors you can feel good about eating. Using a unique blend of herbs and spices for seasoning means there’s no need to rely on high-fat ingredients for a big flavor impact. HERE'S WHAT WE SAY... My sister and I have been trying to do less pizza, burgers and steak sandwiches. 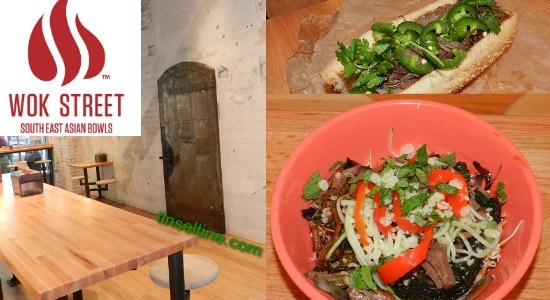 So it's nice to have Snap Kitchen, Fuel and Revolution Taco (see T&T post) in town... And now Wok Street is a great addition to the fast, healthier eating craze. These Signature Bowls are hot and filling. The regular is a very good size. No one's ever accused me of having a small appetite and even I would't attempt to eat the large bowl in one sitting. Additional bowl combos - Thai Tofu, Wok Street Chicken and Veggie Option. You can pile on more of your favorite ingredients with an Add-On $2.99 each protein / $1.49 each veggie or sauce. You can also make your own bowl. Prices range from: Medium $7.89 to $9.19 and Large $9.88 to $11.18. I asked Molly, Wok Street's awesome GM what do people do more of, create their own or order the signature bowls off the menu, she said it's both, they start with a signature bowl and then say, but I don't want this ingredient or I'd rather have that ingredient. Then my sister and I also each tried a Wok Street Signature Sandwich - THE BANH choice of Chicken, Pork, Steak or Tofu (a Wok Street take on the classic Vietnamese hoagie with hoisin mayo, cucumber, jalapeno, pickled red onion and cilantro) Prices: $6.89 chicken or pork / $7.89 Steak or Tofu. The Banh's are also filling, well seasoned and on a very fresh roll, so I would definitely order a Banh again, but I really preferred the bowls. Drink choices ($2.49) include Thai Iced Tea sweetened spiced tea with milk, which I would have definitely ordered, but I'd already had my limit of caffeine for the day. The Ginger Lemonade is also a perfect choice. I'm not much on Green Tea, but for those who partake, there's also a Matcha Japanese Green Tea. No desserts yet, but they plan to soon offer a Tofu Cheesecake with ginger maple syrup.